Managed services means saving money and preventing headaches. Breaking away from the break-fix tradition in IT, managed services is the newest industry buzzword. Rather than being a fleeting trend, however, the shift looks to be a permanent enhancement to how services are provided to subscribers. 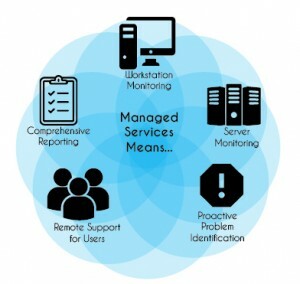 But hold on…what exactly IS managed services? Let’s take a step back: the traditional way of handling tech problems is to, well, wait for there to be a problem. Your team members go along throughout their day until disaster strikes – overheated computers, hard drives crashing because they’re too full, servers slowing down – followed by a panicked, emergency call to your tech provider (ahem, DataPerk). Simple enough, but what if there was a better way? What if these kinds of emergencies could be prevented, so that employees could spend less time waiting for repairs and patches, and more time, well, doing everything else? That is managed services — a service designed to make life for the user easier, by monitoring technology proactively, in order to identify and fix potential hazards before they wreak havoc in the workplace. Using remote monitoring programs, managed services allow tech-firms, like DataPerk, to keep an eye on your IT 24/7, watching out for a slew of potential problems that otherwise couldn’t be predicted. Does Managed Services Save Money? The biggest question around managed services isn’t about the actual effectiveness of the solution — there is no doubt that this approach reduces headaches for the enduser — it’s about the cost effectiveness of it. Is it worth the cost? We’re going to go out on a limb here and guess that one of the hardest things about technology for your business is the difficulty in effectively budgeting costs for the year ahead. You’re not alone – this tireless problem is one that is reported across all industries and sizes of businesses. The variance in monthly billing is a headache for business managers, CFOs, and CIOs in almost every industry, as they try to balance the very real need for technology-based problems to be solved, with the knowledge that it’s like a game of whack-a-mole in trying to predict when pesky problems will pop up. DataPerk managed services help with this problem by offering a reliable, easy to understand pricing structure that is consistent, month after month, year after year. For a low monthly rate based on users, your technology is monitored constantly and you’re alerted when it looks like a problem may be looming, meaning surprise bills for pop-up problems become a thing of the past, while accurate budgets become a thing of the…now! Scenario 1: Your team continuously piles pictures, presentations, records, and more onto your company’s server without thinking twice, until one day, Sarah, your business director, tries to save your latest expansion plan when…nothing. Your server is full, frozen and you’re freaked out. You call your tech-team, who tell you that it’s going to take time that you weren’t planning on to get it cleaned up, and running again. Ouch. That means another bill, and who knows how much down time for your staff, where you can’t access the documents you need to get your jobs done. Scenario 2: Your team continuously piles pictures, presentations, records, and more onto your company’s server without thinking twice, until one day, you get a friendly phone call from a DataPerk tech expert that you trust, letting you know that your server looks like it’s filling up, and that someone will need to remote in to quickly clean it up a bit, at a time convenient for you and your staff. The next day, Sarah tries to save her expansion plan…and doesn’t have to worry about a thing. By preventing potential problems up front, you get to reduce the surprises that cost both your team’s time, and your bottom line. Who is Managed Services Right For? DataPerk’s managed services are a scalable solution for any size business, plus our simple service structure means that your company can get as many, or as few, features and add-ons as you need — all the things you want, with nothing you don’t. Want to talk to a solutions expert to see what you could gain from managed services? Call or click today, and enjoy a totally free consultation!